Turn any mobile device, player, computer, or game system into a karaoke machine! The Singtronic K9H HDMI Karaoke Mixer allows you to add many features to your system simply by connecting the K9H between your HDMI source, such as a Blu-Ray player or computer, and your HDTV or HDMI supported sound system. Stream or play your videos or music and the K9H will mix audio from 2 microphones and allow you to make music volume, echo, and individual microphone volume adjustments. A professional echo processor with Yamaha® Reverb technology is built-in so your echo adjustments sound nice and clear. If you need to listen quietly, a headphone jack on the front panel is available for you to connect headphones. An RCA input and output are available if your system utilizes RCA connections. Professional echo processor with professional grade Yamaha® Reverb technology. Perfectly blends microphone voice and the accompaniment. The professional echo effect can be adjusted depending on the occasion and your preferences making your voice sound clear with minimal noise and distortion. 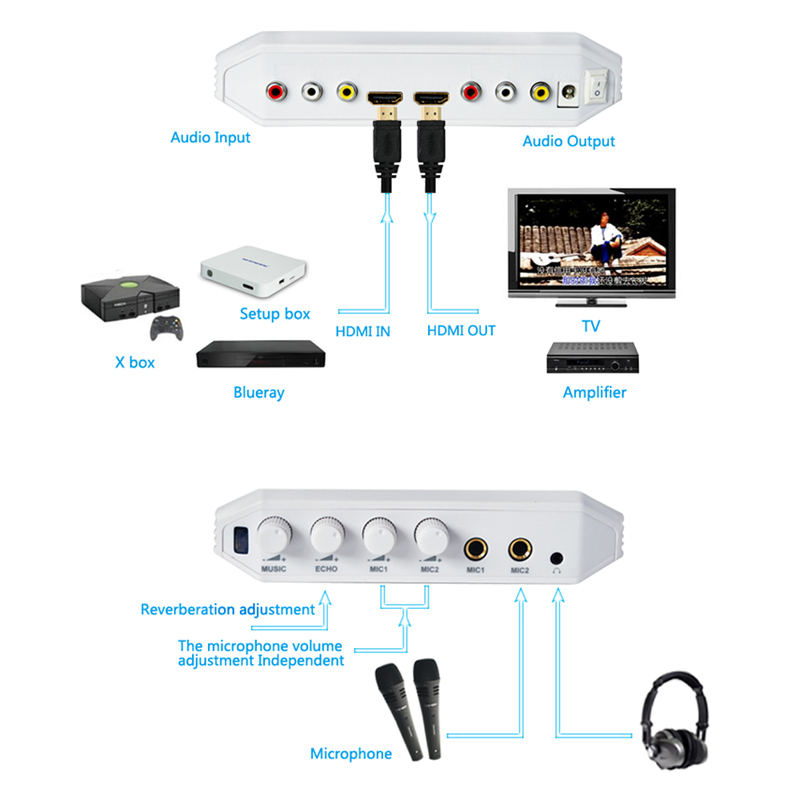 Digital to Analog converter enables you to input via HDMI and output HDMI and L/R RCA Audio together. Dual microphone interface with individual volume control supports a chorus or duets. 1. HDMI Input to RCA Output is enabled. 1. RCA Input to HDMI Output is not enabled (no upconversion).